While Xiaomi did not launch anything at the ongoing #MWC2018, the company seems to be bringing new products to India very soon. 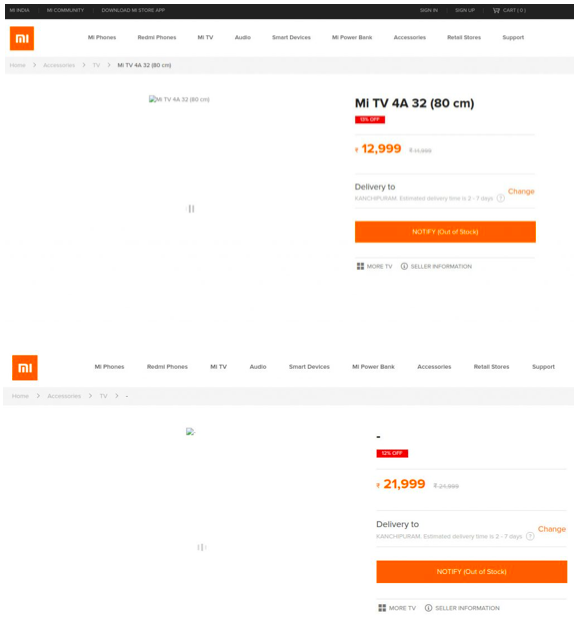 This time, an official listing of the Xiaomi Mi TV 4A Smart TV has surfaced before the release of the television here. Earlier today, Xiaomi teased their upcoming smart TV via a tweet and now the listings have unveiled two Xiaomi Mi TV 4A variants coming to the country. The first one being a 32-inch model and the second one coming with a 43-inch screen. The official listing pages of the TV are out before the launch. As mentioned in the official listings, the key features including the price and screen sizes of the TV sets is out now. The Xiaomi Mi TV 4A will come in 32-inch and 43-inch models. For the uninitiated, Xiaomi recently launched the Mi LED Smart TV 4 with a 55-inch display here in India. Now, starting with the 32-inch variant, it is shown to feature a 32-inch HD panel with 1366 x 768 pixels resolution. It will have a 178-degree viewing angle, 6.5ms Dynamc response and a 3000:1 contrast ratio. Being a smart TV, it is powered by a 1.5GHz quad-core Amlogic 962 processor coupled with 1GB RAM and 4GB internal storage. In terms of connectivity, the Xiaomi Mi TV 4A 32-inch gets WiFi, 2x HDMI ports, AV, USB 2.0, and an ethernet port. Moving to the bigger Mi TV 4A 43-inch, as the name suggests, this one comes with a 43-inch Full HD (1920 x 1080p) resolution display, again with the same 178-degree viewing angle and a 3000:1 contrast ratio. The Xiaomi Mi TV 4A 43-inch gets a quad-core Amlogic T-962 processor, paired with a Mali 450 MP5 GPU, 2GB RAM and 8GB of internal storage. Running on MIUI TV, the Mi TV will come with WiFi, Bluetooth, 2x HDMI, 2x USB 2.0, HDMI, as well as Ethernet ports. The difference here is that the Xiaomi MI TV 4A 43-inch variant supports HDR 10 and will come with Dolby Virtual Surround Sound, DTS and bass boost. Since these are still in rumours, we cannot confirm the prices of the TV sets. The Mi TV 4A 32-inch model is listed to come for Rs. 12,999 while the bigger 43-inch model is expected to be priced at Rs. 21,999. The company has teased these sets so they are expected to be launched soon.